Hi guys finally got my New to me VFR800 home - in Victoria Australia. 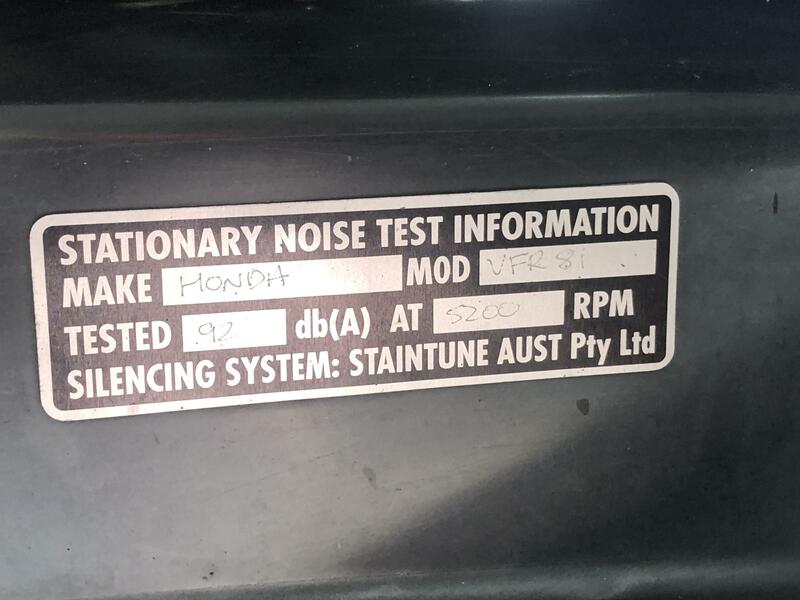 I have to get a roadworthy certificate done and was concerned about the Staintune pipes not being legal and needing to find some standard pipes to get the certificate done. UNTIL I got i home and found this little plate - now I do roadworthys on cars but I am not Motorbike accredited - but this tells me I should be fine. I have never seen one on a bike with aftermarket pipes but maybe I have not looked for it. Anybody else in Victoria had issues even with one of these plates fitted? The plate states that the pipes meet Australian standards at the time of registration. It is all it needs. All Staintune low mount pipes had them, the high mount pipes didn't (5G). However that was with the baffle in, if it has been removed it won't meet regulation, but most people don't know that. You should be pretty much rite, unless you are taking it to an actual vicroads centre to get the roadworthy. Cheers for that. I can’t get in for a RWC until 25th.